Source: Emeril Lagasse and Marcelle Bienvenu, Louisiana Real and Rustic (New York: William Morrow and Company, Inc, 1996), 12. This Brown Chicken Broth has a rich taste and deep color. 01. Preheat oven to 400ºF. 02. Toss the chicken bones with the vegetable oil. 03. Season vegetables with 1/2 tsp salt and 1/4 tsp pepper. 04. Spread the bones and vegetables on a baking sheet; roast for 45 minutes and remove from oven. 05. Spoon the tomato paste evenly over the bones and vegetables. Return to the oven and roast for an additional 15 minutes. 06. Remove bones and vegetables from oven; turn into a large stockpot over High heat. Scrape the baking sheet to loosen any browned bits and add to the pot. 07. To the stockpot, add the remaining 1/2 tsp salt and 1/4 tsp pepper, the peppercorns, thyme, oregano, basil, bay leaves, water and red wine; bring to a boil. Then reduce heat to Medium-Low and simmer, uncovered, for about 2 hours. Then cool. 08. Remove any fat that has risen to the surface; strain. 09. Use now or store in 1- or 2-cup covered containers in the freezer. I like using "Roasted Garlic Tomato Paste" and Cabernet Sauvignon here. 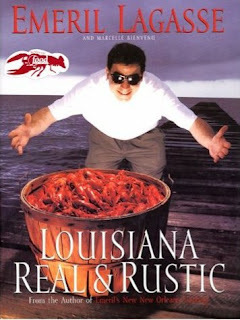 1 Source: Emeril Lagasse and Marcelle Bienvenu, Louisiana Real and Rustic (New York: William Morrow and Company, Inc, 1996), 12.